My wife of 32 years, Margie, started showing symptoms of Alzheimer’s at age 50. Three years later, we met with her primary care physician who ran down the list of warning signs. He was sure it wasn’t Alzheimer’s because “she was way too young for that.” He was wrong. Now at age 57, Margie is in the late stages of younger-onset Alzheimer’s. Margie’s mother died of Alzheimer’s in 2010 and her sister, now in her early 50s, was just diagnosed. One of the things I want to do with my life is raise awareness. My hope is that the action it inspires will lead to a day when Alzheimer’s doesn’t devastate anyone else. Today is about action. Along with friends and family, including our three children, I am participating in Alzheimer’s Association The Longest Day, a 16-hour event to raise awareness and funds for Alzheimer’s support, care and research. Our team name, “Minds Over Matter,” is an inspiring-if-complex reflection of our family and friends’ collective effort to combat the devastating impact of Alzheimer’s with hope and strength. The team consists of a core group of 12 people doing a range of activities from running and walking to skateboarding and cycling. I think for all of us, it’s kind of empowering—a small way to do something about what feels like a hopeless situation. It’s also a tribute to Margie, who was driven to help others. Twenty years ago, she founded the food pantry in the Boston suburb where we live, and she managed it until she became too ill to continue. In 2006, the town named her Citizen of the Year for her lifetime of community service. Accepting that Margie’s has younger-onset Alzheimer’s and managing the day-to-day challenges often feels overwhelming. Participating in The Longest Day with my family and friends is my small way of fighting back. I want to raise awareness of the devastating impacts of this disease on families and provide funding for Alzheimer’s research. It is my hope that together we can end Alzheimer’s so other families will be spared the pain and hopelessness we have experienced. About the blog author: Matt Steele cares for his wife, Margie, who has younger-onset Alzheimer’s. He is helping to raise awareness and funds with team Minds Over Matter in Alzheimer’s Association The Longest Day®, a sunrise-to-sunset event to honor those living with Alzheimer’s disease and their caregivers. Matt is also a member of the Alzheimer’s Association Alois Society. I too are in the same situation. My wife Barb was diagnosed at the age of 57. She will be 63 on Sunday the 30th. She is in a care facility for the rest of her life. I cared for her at home until March 1st. She was a beautiful vibrate women most all of her life. Loved by everyone she knew. This disease is so destructive to the people around it. I would give anything to pull her back to who she was but I know that will never happen. My heart goes out to you, Matt. My husband was 53 when he was diagnosed with younger onset Alzheimer's disease. He passed away at age 59. I cared for him with the help of some wonderful people also. God bless you and your wife. May we someday find a way to prevent this, so no one ever has to go through what we have been through. My grandmother died of "hardening of the arteries to the brain" in the 60's, which I believe would be considered alzheimers now. My mom had alzheimers, as did her cousin, and my uncle, and I wonder if it's genetic, or dietary? I am in my mid fifties, and wonder if there is testing available, or signs I and my family can look for? I am floored reading this story and these comments. I didn't realize how prevalent early onset Alzheimer's really is. My cousin, Donna, was diagnosed with it at the age of 54. She died last summer in her mid-60s. Her husband did everything possible to help her. She probably visited every possible research center in existence. My grandmother passed at the age of 99…she was diagnosed with Alzheimer's when she was around 82. 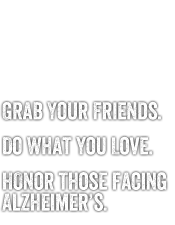 I have also had three aunts that have passed with Alzheimer's. I do feel it is hereditary…and the changes of my mom, as well as my sisters and I of getting the disease is great. I am considering suggesting our company form a team for this year's Longest Day. Our company has a hospice division and I believe it would very appropriate. God bless each of you that have commented here. I have seen this terrible disease…at every stage and it does affect everyone…not just its unfortunate victim. Kathy my wife was also diagnosed at age 57 and now 66 years old i am proud to have her and be with her, with Hopspice at our side. We are in Tupper Lake, NY for the summer at our son's house.Does anyone know where Longest Day activity is in this region? Good luck to all, take care and God Bless Us All.